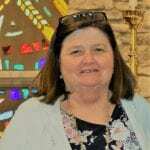 Margaret Egan has been the principal of Saints Peter and Paul School (SSPP) since 2002 after serving as a fourth-grade teacher for over thirty years. The school was entering its second year when Egan became Principal. As a woman of vision, Principal Egan has worked hard to develop the culture of the school as she expanded the school motto “Hearts to Love, Hands to Serve” into the school’s mission statement. Principal Egan has left her mark at SSPP through transparency, accessibility, and being open to new ideas. She endlessly guides students, teachers, and parents to work together in positive ways to promote success. The culture of success and excellence is the foundation of the school. While her vision continues to evolve, the basic tenets behind the vision remain the same – service to others, rigorous academics, and strong leadership all rooted in faith. One of Principal Egan’s strengths is her relationships with students, faculty, staff, parents, the pastor, board members, and the community at large. Principal Egan takes pride in knowing and interacting with every student. For example, she greets each student in the morning and interacts with the middle school students during the student-run TV studio broadcasts. Students fill the technical, photography, and on-air talent roles for the studio. At lunchtime, Principal Egan is in the cafeteria to remind students that eating together each day is important and that mealtime is a time to interact with each other in positive ways. Under her leadership, SSPP has paved the way for other Catholic elementary schools in the county, by establishing the first student-run TV studio and a student-run school store that belongs to the West Chester Chamber of Commerce. The store, “Saints Peter and Paul Hall Mall,” involves middle school students choosing consumer-based products, developing sales and promotion strategies, daily staffing the store, and raising money to support charities. Student entrepreneurs oversee the $4000 per year earnings success. When an independent living senior center opened nearby, Principal Egan arranged for the third graders to visit the center during holidays to entertain the residents. She started a service project for middle school students by having them write notes and fill Christmas stockings with small personal items for all the senior residents. A couple retired teachers living at the center now tutor students who are struggling in math or reading several days a week. The seniors demonstrate the importance of volunteering and serving others while students learn the importance of service to others. As a result, the senior community has become a more vital part of the parish overall. Principal Egan has an uncanny ability to make every student and teacher feel confident, secure, and motivated so that they will venture out of their comfort zone and strive to better themselves. She provides students, teachers, and staff opportunities to grow in self-confidence and self-esteem. She approaches everyone with love and understanding, patience and guidance, and an enthusiasm for learning that results in an exceptional academic environment. As a result, Saints Peter and Paul School has flourished over the years to become what it is today – a warm, welcoming, yet academically challenging, environment, through hard work, dedication, and paying attention to what makes a great school.